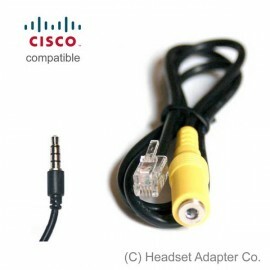 Cisco iPhone Headset Adapter facilitates easy connection between a single-plug iPhone, Blackberry, HTC or other smartphone headset, and Cisco Unified IP phone. This cord fits selected Cisco 7900, 6900 and 9900-series phones. It is not compatible with Cisco SPA500 phones or other brand phones. Quite a bit of static, but only at my end. Does what I need it to. Very functional with our phone system at work! I use it with my Iphone headset so I don't get tired for long hours on the phone. I stopped using my wireless headset, or very little. :-) I use it with the Cisco VOIP phone at work. I would definitely recommend. It works out of the box. I even told my friend to get one for himself. I didn't mind the yellow color. It's works as advertised. It does exactly what you expect it to. I'm using it with Etymotics Hf2 earbuds and a Cisco 7941 phone. I did confirm that the button on your iphone line mic does not do anything, but I don't think that's a limitation of this adapter. It seems none of the cisco headsets have any kind of button on them, so I guess the cisco headset port doesn't support anything.